Cities Are Taxing Ride-Hailing Services Like Uber and Lyft. Is This a Good Thing? With ride-hailing services like Uber and Lyft continuing to gain popularity and drawing attention for their impact on congestion and other urban ills, cities from Washington to São Paolo are moving to the seemingly inevitable next step: special taxes. This is unsurprising. Recent researchshows that ride-hailing services are contributing to dropping public transport rates and increased private vehicle travel on already-clogged streets. However, new taxes and fees shouldn’t just raise revenue. They can do more than that: they can make cities more livable and transport more sustainable. If ride-hailing is taxed, the mechanism and revenue should be used in carefully targeted ways that improve urban mobility overall. More than a handful of governments have enacted or are considering fees or taxes, that range from flat-rate fees per ride to taxing as a percent of the ride to systems that target certain types and locations of trips. These take a variety of forms. For example, Mexico City charges 1.5 percent of ride fare; Washington, D.C., recently raised its tax from 1 to 6 percent of ride fare. Massachusetts levies a 20-cent tax on every trip. Porto Alegre has a monthly fee per licensed vehicle. A full inventory of city measures to gain revenue from ride-hailing services is provided in a spreadsheet compiled by WRI Ross Center for Sustainable Cities. While new taxes bring in new revenue, these monies aren’t necessarily making it easier to get around. For example, in Rhode Island a 7 percent tax on ride-hailing sends revenue directly to the state’s general fund. In Philadelphia, a 1.4 percent tax sends money mostly to schools and the remaining third to the city’s parking authority. These taxes are also not high enough to change travel behavior in a meaningful way, since transport can sometimes be less sensitive to higher prices. 1. Encourage more sustainable trips for all users.Any discussion should begin with a consideration of allvehicle traffic. People driving their own private cars continue to dominate traffic, and cause congestion, in most cities. Places like London, Singapore and Stockholm are known for their congestion charges, but no city has yet comprehensively factored in ride-hailing. Efforts to charge all road users are bubbling up, however. New York City flirted with a proposal to implement a congestion charging zone coupled with ride-hailing fees, but the State of New York balked and implemented only the ride-hailing fees, leaving anyone driving their own personal car into Manhattan’s central business district untouched. If cities are going ahead with taxes only on ride-hailing, they should encourage sustainable and shared travel over single-occupant rides. This means taxing ride-hailing as a percent of the fare or indexing to distance travelled, rather than a flat fee that would be the same regardless of the ride fare or distance. Most cities are already going this route. Moreover, shared rides can be taxed at a lower rate than solo rides, or rather, solo rides could be taxed more to incentivize pooled rides. A current proposal in Washington, D.C., aims to reduce the planned tax to 1 percent for pooled rides. 2. Promote equity and access. Taxes should encourage service to transit-poor areas of the city and connectivity to transit generally. Most especially, they shouldn’t hinder new mobility services where they may provide low-cost rides to residents in low-income areas or areas poorly serviced by public transport. 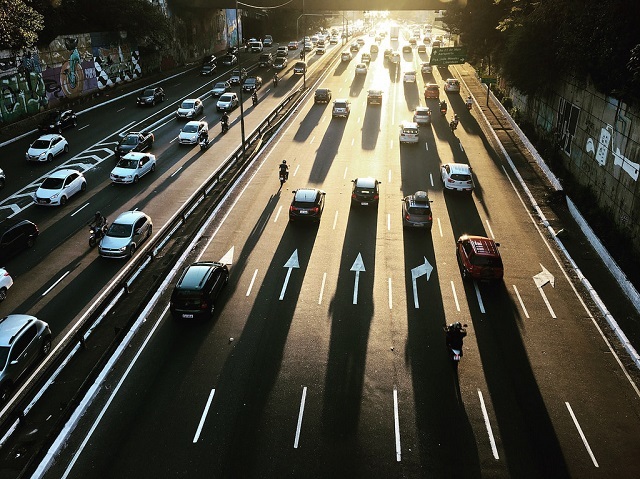 São Paulo, the first city to regulate ride-hailing in Brazil, applies its taxaccording not only to vehicle miles traveled but also equity factors such as whether a driver is a woman and whether the vehicle is accessible to the handicapped. Shared, electric/hybrid, off-peak and weekend trips are all further discounted. A next consideration of cities may be how to incentivize integration with public transit or access to poorly service areas. 3. Invest revenue in multiple modes.Revenue from ride-hailing taxes, like many existing gas taxes or subway fares, should go toward improving mobility systems. It’s also important to support other modes of transport beyond the large public transit systems most commonly assumed to suffer from ride-hailing (like metro rail and buses). Improving road safety or adding bicycle lanes and pedestrian spaces are also ways to support a more holistic approach to urban transport. 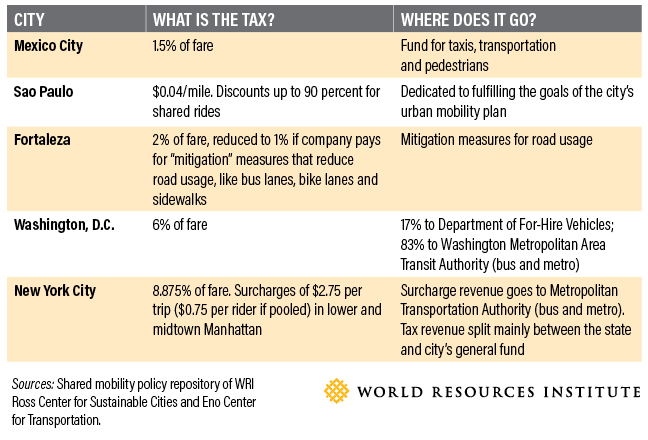 Washington, DC’s 6 percent tax on all ride-hail fares will fund the metro area’s public transport agency, yet it is limited to public transport and not aimed at increasing cycling or walking. Fortaleza, Brazil, on the other hand, reduces its 2 percent tax on every trip to 1 percent for companies that make contributions towards urban mobility projects, such as sidewalks, bus lanes, bicycle lanes and bikeshare stations. Ironically, a more useful guide may be London’s congestion charge, which exempts for-hire vehicles such as ride-hailing services. To reduce traffic in highly-congested areas, the city charges all cars entering central London and uses the £1.7 billion ($2.2 billion) revenue to improve bus services, bicycle commuting and walking, and road safety. And recently, Transport for London is proposing expansion of its congestion charge to for-hire vehicles. How Does Ride-Hailing Fit the Bigger Picture? As new mobility services change cities and the way people move, today’s decisions on taxes and other regulations can help shape a more sustainable mobility for all. There is more to consider, in terms of how to tax, how much to charge and where to send revenues—but taking a more holistic approach to understanding the impact of those policies is a good start. This article was originally published on WRI Insights. Ben Welle is Global Health & Road Safety Manager at WRI Ross Center for Sustainable Cities. Guillermo Petzhold is Urban Mobility Specialist at WRI Brasil. Francisco Minella Pasqual is an Urban Mobility Intern at WRI Brazil. In Las Vegas, Ride-Hailing Is Eating Away at Taxis. The Effect on Public Transit Is Less Clear. Tags: Ben Welle, congestion, D.C., Francisco Minella Pasqual, Guillermo Petzhold, Lyft, ride-hailing, ride-sharing, São Paulo, sustainable urban transport, transit-oriented development (TOD), Uber, urban mobility, Washington, D.C.